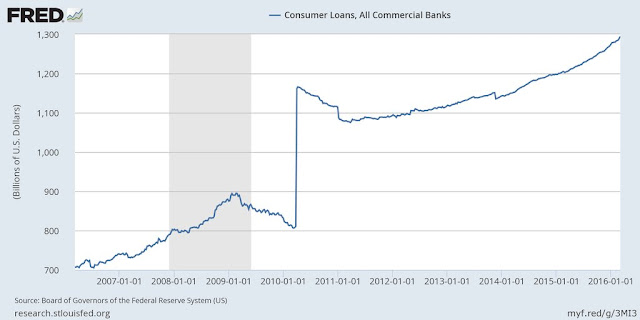 Commercial bank loans to consumers are exploding---thanks to Fed money printing. It is difficult to understand how this will not eventually be a major driver of consumer price inflation. Loans outstanding are nearly twice as high as January 2007. Why the huge jump up in January of 2010? This was shortly after "cash for clunkers". Maybe that's the difference? From what I could find, the cash-for-clunkers program began in July of 2009 and ended in August of that same year. The jump looks to have occurred around February, 2010. Could it be an anomaly or some kind of adjustment to the numbers? Accounting regs changed. SPV's were brought onto balance sheets. In reality, little to no growth in credit from recent data. Thanks Jim Kannry. Yes, remove the spike and the current number is about 30-40 billion above the last peak. It's trending upward, however, and at the same incline as the growth leading up to the bubble's peak.